In recent decades, irregular rainfall has evidenced a number of adverse environmental and socioeconomic effects worldwide. The goal of this study was to analyze the ability of four Regional Climatic Models (RCM's) forced by ERA-Interim to capture the humid and dry extreme monsoons in the Core North American Monsoon (CNAM), considering the oceanic mechanisms of the Pacific and Atlantic. From available databases in the network and for the period 1990-2008, we obtained: 1) average observations (obs mean); after obtaining four sets of observed precipitation data: UDel, CLICOM, GPCP and CRU, 2) from the Coordinated Regional Scale Reduction Experiment (CORDEX) -of North America (NA), four RCM's were obtained forced by ERA-Interim, 3) number and intensity of Pacific hurricanes, and 4) calculation of Caribbean Low Level Jet (CLLJ) anomalies, the Filtered Variance (VF), the Decadal Pacific Oscillation (PDO) and the Atlantic Multidecadal Oscillation (AMO). Two extreme monsoons were selected: one wet (1990) and one dry (2005). To all the data, they were applied the test of normality of Shapiro Wilk. It was calculated a Pearson correlation and a hypothesis test, with a confidence level of 95% (P<0.05) and 99% (P<0.01) between the models, Era-Interim, the observations and oceanic indexes. Regardless of the oceanic indexes, HadGEM3-RA and ERA-Interim were the that better captured precipitation in wet monsoons; And ERA-Interim and Reg1 proved to be better at capturing precipitation for dry monsoons. The 1990 monsoon presented almost twice as much precipitation as the monsoon of 2005. This wet anomaly could be associated with the occurrence of 16 hurricanes near the Gulf of California by 1990, since in 2005, only 7 hurricanes occurred. VF and CLLJ are inversely proportional and are two significant predictors of wet monsoons in the CNAM. ERA-Interim better captures precipitation in extreme wet years. PDO, was significantly and negatively correlated with REMO (Pr = -0.90) and CLLJ (Pr = -0.90), that is to say, REMO has no ability to capture dry monsoons that occur when -PDO (La Niña) and -CLLJ (La Niña) phases are present. The dry events are significantly associated with the occurrence of -PDO (La Niña) phase anomalies and not with the occurrence of -CLLJ (La Niña) phase anomalies. This methodology is an effective alternative to predict extreme hydroclimatic events in CNAM, especially when there is no data from weather stations. Adler R.F., Huffman G.J., Chang A., Ferraro R., Xie P., Janowiak J., Rudolf B., Schneider U., Curtis S., Bolvin D., Gruber A., SUSSKIND J., Arkin P. (2003). The Version 2 Global Precipitation Climatology Project (GPCP) month-ly precipitation analysis (1979-present). J. Hydrometeorol., 4: 1147–1167, 2003. Brito C.L., Vivoni E.R., Gochis D.J., Filonova., Tereshchenko I., Monzon C. (2010). An anomaly in the occurrence of the month of maximum precipitation distribution in northwest Mexico. Journal of Arid Environments, 74, 531. Bukovsky M.S., Gochis D.J., Mearns L.O. (2013). Towards assessing NARCCAP regional climate model credibility for the North American Mon-soon: current climate simulations.J. Clim. 26: 8802–8826. doi: 10.1175/JCLI-D-12-00538.1. Bukovsky M.S., Gochis D.J., Mearns L.O. (2013). Towards assessing NARCCAP regional climate model credibility for the North American Mon-soon: current climate simulations.J. Clim., 26: 8802–8826. doi: 10.1175/JCLI-D-12-00538.1. Camacho S.J. (2008). Asociación entre variables: correlación no paramétrica. AMC, vol. 50 (3), 144-146. Castro C.L., Chang H., Dominguez F., Carrillo C., Kyung S.J., Juang H. (2012). Can a regional climate model improve warm season forecasts in North America. J. Clim., 25: 8212–823. Cavazos T., Comrie A.C., Liverman D.M. (2002). Intraseasonal anomalies asso-ciated with wet monsoons in SE Arizona.J. Clim. 15: 2477–2490. Cavazos T., Turrent C., Lettenmier D. (2008). Extreme precipitation trends as-sociated with tropical cyclones in the core of the North American Mon-soon.Geophys. Res. Lett., 35: L21703. doi: 10.1029/2008GL035832. Cerezo M.R., Allen M., Jones R. (2011). Mechanisms controlling precipitation in the northern portion of the North American Monsoon.J. Clim. 24: 2771–2783. doi: 10.1175/2011JCLI3846.1. Cerezo M.R., Cavazos T., Arritt R., Torres A.A., Sieck K., Nikulin G., Okiah M., Salinas P.J.A. (2016). CORDEX-NA: factors inducing dry/wet years on the North American Monsoon region. Int. J. Climatol. 36: 824–836. Chávez F.P., Strutton P.G., Friederich G.E., Feely R.A., Foley G.C., Mcphaden M.J. (1999). Biological and chemical response of the equatorial Pa-cific Ocean to the 1997-1998 El Niño”. Science, 286: 2126-2131. Emanuel K.A. (1991). A scheme for representing cumulus convection in large scale models.J. Atmos. Sci., 48: 2313–2335. Espinosa C.T.L., Valdez H.J.E. (2007). Variabilidad interanual de clorofila en el golfo de california. Ecología Aplicada, 6:(1,2). Fritsch J.M., Chappell C.F. (1980). Numerical prediction of convectively driven mesoscale pressure systems. Part I: convective parameterization.J. Atmos. Sci., 37: 1722–1733. Gershunov A., Barnett T.P. (1998). Interdecadal modulation of ENSO telecon-nections. Bull. Am. Meteorol. Soc., 79: 2715 – 2725. Giorgi F., Coppola E., Solmon F., Mariotti L., Sylla M.B., Bi X., elguindi n., Diro G.T., Nair V., Giuliani G., Turuncoglu U.U., Cozzini S., Güttler I., O’brien T.A., Tawfik A.B., Shalaby A., Zakey A.S., Steiner A.L., Stordal F., Sloan L.C., Brankovic C. (2012). RegCM4: model description and preliminary tests over multiple CORDEX domains. Clim. Res., 52: 7–29. doi: 10.3354/cr01018. Giorgi F., Jones C., Asrar G. (2009). Addressing climate information needs at the regional level: the CORDEX framework. WMO Bull. 58(3): 175–183. Gochis D.J., Brito C.L., Shuttleworth W.J. (2006). Hydroclimatology of the North American Monsoon region in northwest Mexico. J. Hydrol. 316: 53–70. Gregory D., Rowntree P.R. (1990). A mass-flux convection scheme with repre-sentation of cloud ensemble characteristics and stability dependent closure.J. Geophys. Res., 92: 14198–14203. Grell G.A. (1993). Prognostic evaluation of assumptions used by cumulus pa-rameterizations. Mon. Weather Rev., 121: 764–787. Gutzler D.S., Kim H.K., Higgins R.W., Juang H.M.H., Kanamitsu M., Mitchell K., Mo K., Pegion P., Ritchie E., Schemm J.K., Schubert S., Song Y., Yang R. (2005). The North American Monsoon model assessment project: integrating numerical modeling into a field-based process study. Bull. Am. Meteorol. Soc. 86: 1423–1429. Hammer Ø. (2015). PAleontological STatistics Version 3.08 Reference manual, 243. Hare S.R., Mantua N.J. (2000). Empirical evidence for North Pacific regime shifts in 1977 and 1989, Prog. Oceanogr., 47, 103–145. Hare W.L. (2003). Assessment of knowledge on impacts of Climate Change – Contribution to the Specification of Art. 2 of the UNFCCC: impacts of ecosys-tems, food production, water and socio–economic systems. [http://www.wbgu.de/wbgu_sn2003_ex01.pdf. : Feb. 2, 2011]. Hewitt H.T., Copsey D., Culverwell I.D., Harris C.M., Hill R.S.R., Keen A.B., Mclaren A.J., Hunke E.C. (2011). Design and implementation of the infrastruc-ture of HadGEM3: the next generation Met Office climate modelling system. Geosci. Model Dev., 4: 223–253. doi: 10.5195/gmd-4-223-2011. Intergovernmental Panel on Climate Change (IPCC). (2013). Climate Change 2013: The Physical Science Basis. 33. Jacob D. (2001). A note to the simulation of the annual and inter-annual varia-bility of the water budget over the Baltic Sea drainage basin. Meteorol. Atmos. Phys., 77: 61–73. Jacob D., Elizald A., Haensler A., Hagemann S., Kumar P., Podzum R., Rechid D., Remedio A., Saeed F., Sieck K., Teichmann C., Wilhelm C. (2012). As-sessing the transferability of the regional climate model REMO to different co-ordinated regional climate downscaling experiment (CORDEX) regions. At-mosphere 3: 181–199. doi: 10.3390/atmos3010181. Kain J.S., Fritsch J.M. (1990). A one-dimensional entraining/detraining plume model and its application in convective parameterization. J. Atmos. Sci., 47: 2784–2802. Kain J.S., Fritsch J.M. (1993). Convective parameterization for mesoscale mod-els: the Kain-Fritsch scheme. The representation of cumulus convection in nu-merical models. Meteorol. Monogr., 24: 165–170. Llanes C.O., Norzagaray C. M., Muñoz S.P., Ruiz G.R., Troyo D.E., Álvarez R.P. (2015). Hydroclimatic Trends in Areas with High Agricultural Productivi-ty in Northern Mexico. Pol. J. Environ. Stud., 24: 3, 1165-1180. Llanes C.O., Norzagaray C.M., Muñoz S.P., Ruiz G.R., González O.H., Herre-ra M.M.N. (2016). Estimating Trends and Return Periods of Daily Extreme Precipitation Associated with Tropical Cyclones in the Core North American Monsoon. Pol. J. Environ. Stud. 25 (6), 2283-2292. Lluch C.S.E., Aragón N.E.A., Arreguín S.F., Aurioles G.D., Bautista R.J.J., Brusca R.C., Cervantes D.R., Cortés A.R., del-monte L.P., Esquivel H.A., Fer-nández G., Hendrickx M.E., Hernández V.S., Herrera C.H., Kahru M., Lavín M., Lluch B.D., Lluch C.D.B., López M.J., Marinote S.G., Nevárez M.M.O., Ortega G.S., Palacios C. E., Parés S.A., Ponce D.G., Ramírez R.M., Salinas Z.C.A., Schwartzlose R.A., Sierra B.A.P. (2007). The Gulf of California: Re-view of ecosystem status and sustainability challenges. Progress in Oceanogra-phy, 73: 1–26. Mantua N.J., Hare S.R., Zhang Y., Wallace J.M., Francis R.C. (1997). A Pacif-ic Interdecadal Climate Oscillation with impacts on salmon, Bull. Am. Meteor-ol. Soc., 78, 1069–1079. Méndez M., Magaña V. (2009). Regional Aspects of Prolonged Meteorological Droughts over Mexico and Central American, Journal of Climate, 1175-1188. Mitchell T.D., Jones P.D. (2005). An improved method of constructing a data-base of monthly climate observations and associated high-resolution grids. Int. J. Climatol., 25: 639–712. Muñoz A.F., Avissar R., Zhu C., Lettenmaier P.D. (2009). Sensitivity of the water resources of Rio Yaqui Basin, Mexico to agriculture extensification under multiscale climate conditions. Water. Resour. Res., 45: W00A20. doi: 10.1029/2007WR006783. Ormaza G.F.I. (2016). Eventos oceanográficos de alta y baja frecuencia en El Océano Pacífico Ecuatorial Este. Evaluación de su seguimiento y predicción. Revista Internacional de Investigación y Docencia (RIID): 2445-1711. Romero V.E., Zayztev O., Morales P.R. (2007). Tropical cyclones statistics in the Northeastern Pacific.Atmosfera, 20(2): 197–2013. Samuelsson P., Jones C.G., Willén U., Ullerstig A., Gollvik S., Hansson U.L.F., Jansson C., Kjellström E., Nikulin G., Wyser K. (2011). The Rossby centre re-gional climate model RCA3: model description and performance. Tellus, 63A: 4–23. Seastrand S., Serra Y., Castro C., Ritchie E. (2014). The dominant synoptic-scale modes of North American Monsoon precipitation. Int. J. Climatol. doi: 10.1002/joc.4104. Tamara P.I., Maria A.F., Silva D., De Paula D.S., Leila M.V., Freitas D.E. (2017). Trends and variability in extremes of precipitation in Curitiba – South-ern Brazil. 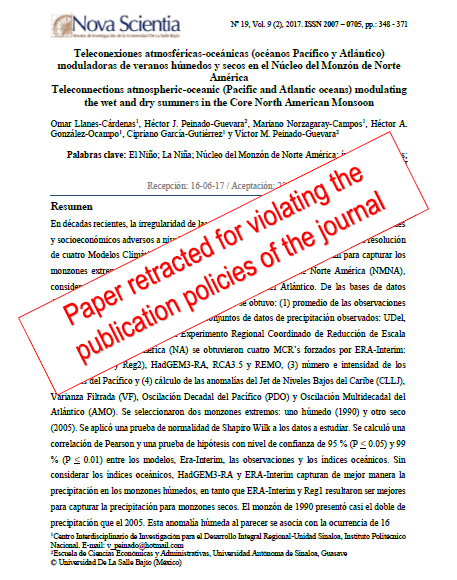 INTERNATIONAL JOURNAL OF CLIMATOLOGY, 37: 1250–1264. Tiedtke M. (1989). A comprehensive mass-flux scheme for cumulus parameteri-zation in largescale models. Mon. Weather Rev., 117: 1779–1800. Trenberth K.E. (1997). The Definition of El Niño. Bull. Amer. Met. Soc., 78: 2771-2777. Villasenor A.J.A. (2009). González E.E. A generalization of Shapiro-Wilk test for multi-variate normality. Communications in Statistics –Theory and Meth-ods, 38, 1870. Wang C., Enfield D.B. (2003). A further study of the tropical Western Hemi-sphere Warm Pool.J. Clim.16: 1476–1493. Willmott C., Matsuura K. (1995). Smart interpolation of annually averaged air temperature in the United States. J. Appl. Meteorol., 34: 2577–2586. Wolter K. (1987). The Southern Oscillation in surface circulation and climate over the tropical Atlantic, Eastern Pacific, and Indian Oceans as captured by cluster analysis. J. Climate Appl. Meteor., 26, 540-558. Zhang Y., Wallace J., Battisti D. (1997). ENSO-like interdecadal variability: 1900–93. J. of Clim., 10: 1004-1020. Zhu C., Cavazos T., Lettenmaier D.P. (2007). Role of antecedent land surface conditions in warm season precipitation over Northwestern Mexico. J. Clim., 20: 1774–1791. Zhu C., Lettenmaier D.P., Cavazos T. (2005). Role of antecedent land surface conditions on monsoon rainfall variability. J. Clim., 18: 2824–2841, 2005.